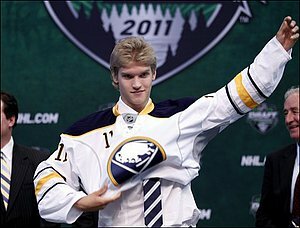 The Buffalo Sabres went into the first round of the 2011 NHL Entry Draft with a specific player in mind, and they got him with the 16th overall pick, selecting Finnish forward Joel Armia. Armia spent the 2010-11 season playing with Assat of the Finnish Elite League. He also skated at HSBC Arena as he represented Finland in the 2011 IIHF World Junior Championship, but it was his play in Finland, against older competition, that drew the Sabres to the 17-year-old Armia. Although Armia will most likely play next season in Finland, the 6-foot-3, 191-pound native of Pori, Finland was thrilled to be drafted by Buffalo. “I’m very excited,” he said moments after being selected. Armia’s ability and desire to score goals drew comparisons to Finnish great Teemu Selanne from Armia’s coach with Assat, Pekka Rautakallio, who also noted there was room for improvement in his game. While the Sabres watched Armia skate in Buffalo during the World Juniors, they also had as many as three different scouts travel overseas to watch him play in Finland at various times and compiled a healthy amount of video to go along with their in-person accounts. From there, they continued to watch him and eventually made up their minds that he was their target. Central Scouting’s Director of European Scouting Goran Stubb also offered an evaluation of Armia. “He's big and tall but surprisingly mobile for a player of his size,” Stubb said. “He has a very good feel for the game and moving the puck well with his linemates. He has a heavy wrist shot that he gets off quickly and is always looking for the empty spots on the ice. He's a sniper with a good selection of shots. You might have to look for him during some shifts, but then, suddenly, he scores the winner." In other Sabres news, Regier told reporters on Friday that the team re-signed goaltender David Leggio. The Williamsville, NY native went 22-12-5 with a 2.80 goals against average, a .911 save percentage and three shutouts last season for Portland of the AHL.